The San Pedro Traffic Department was under much scrutiny as information of licenses being sold was brought to light, among other allegations. As a result of those allegations and investigations into the matter, certain members of the previous Traffic Department Staff were consequently let go. The Ambergris Caye Traffic Control Committee (ACTCC) was then dissolved and a new Board was appointed. The new ACTCC is comprised of the Mayor of San Pedro Elsa Paz; Chairman of the Committee and Deputy Mayor Mr. Pablo Ico; a member of the Police Department, Mr. Osmin Rodriguez, Mr. Raul "Coco" Gonzalez representing the Taxi Association; and the Manger of the Traffic Department Mr. Chris Nuñez. These individuals are chartered with the responsibilities of issuing permits for importation of vehicles, the collection of licensing fees and traffic violations fess as well as the issuance of driver's license and other transport related procedures. In a small community like San Pedro's town core, which hosts the majority population on the island, the almost 2500 vehicles present, causes a visible problem with traffic congestion. At the last count of vehicles on the island, the almost 2,500 vehicles included some 80+ taxi cabs, 1867 private vehicles, 131+ Goods vehicles and over 365 motor cycles. Further to this information, the community already hosts approximately 10 golf cart rentals. There is a constant outcry from tourists as well as residents, of the many vehicles on the congested streets, causing crossing problems, as well as being a safety factor for our many children that must travel these streets to and from schools. 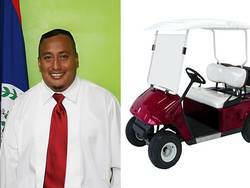 Information reached The San Pedro Sun office of a recent approval for a Town Council member to import some 25 golf carts to the island. The golf carts were presumably for a new golf cart company. As well, the information also indicated that certain individuals holding high positions at various business establishments in the community had been granted permission to import vehicles. According to members of the Golf Cart Rental Owners Association, comprised of seven golf cart rental companies on the island, and concerned citizens, this never should have happened, as there is a moratorium on the importation of vehicles to the island. In an interview with Mr. Pablo Ico, the subject of scrutiny, he informed The San Pedro Sun that "yes, I was granted the permit. The permit was approved by the board. It is a legal business that is being done. I applied, like anyone else and the application was approved. This is a business that my wife and I have decided to undertake. As far as whether I can afford it, the banks are there for you to check the financial information". Mr. Ico maintains that the decision to grant him the permit was made by the entire board after careful consideration. Deputy Mayor Pablo Ico, further explained, "Before we took over transport, lots of corruption was going on, everyone knew it but no one wanted to do anything. This is mainly because San Pedro is such a small community that almost everyone is related to each other. In an attempt to recover some losses and bring order to the ACTCC, we are scrutinizing the books that have been passed to us. So far, we have discovered various gaps within the driver's license serial numbers. On a daily basis, we have individuals coming into the office for renewal and we have to tell them that they need to do the entire process over as there exists no record of their licensing information." As far as the moratorium being placed on golf carts on the island, Mr. Ico explained, "we have a moratorium on motorized vehicles such as cars, SUV's and trucks, however when it comes to a recommendation from any minister, the committee has to honor it". He explained that there are various vehicles that have been recently approved as a result of recommendations from Minister Manuel Heredia.As far as the congestion problem that exists, Mr. Ico informed The San Pedro Sun that the ACTCC is working to correct this situation. Measures taken to rectify this problem include the re-enforcement of alternate parking, increase street signs, as well as the planned upgrade of the roads on the north. This he mentioned would help to decrease the congestion in town.